With GLUT we can define subwindows, i.e. 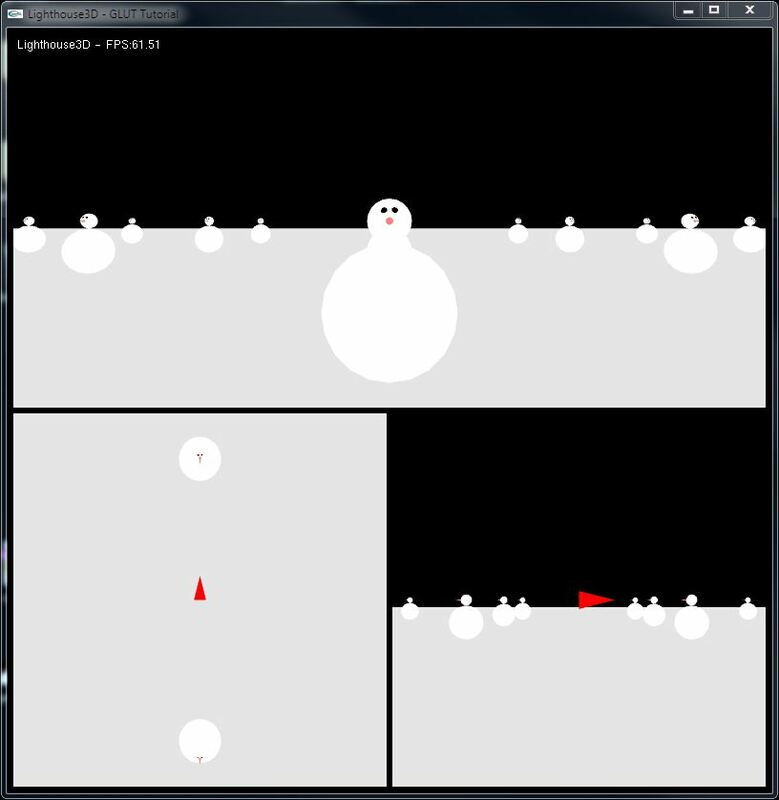 divide the main window in different regions, each with its own OpenGL context and callbacks. One possible application is to provide several views of the same scene simultaneously. A subwindow can also be a parent window for other subwindows. According to GLUTs spec subwindows can be nested arbitrarily. As mentioned before a subwindow has its own OpenGL context, so for instance if we’re using VBOs we’ll need to create them for every window and subwindow where we want to render them. The same applies to most of the callback functions. At the very least we must register the display function for each window we create using glutDisplayFunc. For each window, we must also register callbacks for cursor changes and mouse event handling, if we want to use these features. Pop-up menus are also assigned to a particular window. Note however that there is only one idle function. Assume we want to create a setup with three views. One for the main camera, another with a view from the top, centred on the main camera, and a third one from the side, again centred on the main camera. The following figure illustrates the layout. The following code is a more complete version of the initialization required. We’ve created a function to register the callbacks and perform some OpenGL initialization since this will be used in all subwindows. We also declare three variables to store the window and subwindow ids, we’ll need them latter. The above code creates three subwindows. Each subwindow is used to represent a different viewpoint of the same scene. 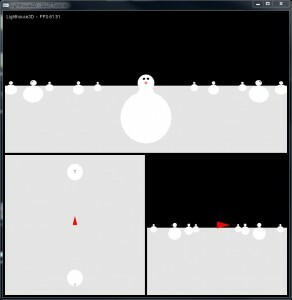 The top subwindow represents the free moving camera, the bottom left the view from the top, and the bottom right the view from the right. When a window is created, either the main window or a subwindow, it becomes the current window. All callbacks registered then are relative to the current window, except the idle function, that as mentioned before is unique for the whole application. Note that we did call initScene for all the subwindows to initialize the OpenGL context for the subwindow. Also note that we only register the reshape func once for the main window. A subwindow can be destroyed when no longer needed. In order to do that, we can use the function glutDestroyWindow. This function destroys the window, any subwindows it contains, and all OpenGL contexts for the destroyed windows. In the next sections we’ll look at the reshape and render functions.